I don't know, hoomin. You'll have to get your own couch! - Thank you, Erica and Utah Rabbit Rescue! PS: Erica says, "This is Harley two days after going to his new home. He was dumped in a park, trapped and then turned to us. We have no idea how long he had to fend for himself, but he was covered in mats and was very underweight. As you can see, he was obviously meant to be a pampered house bunny!" 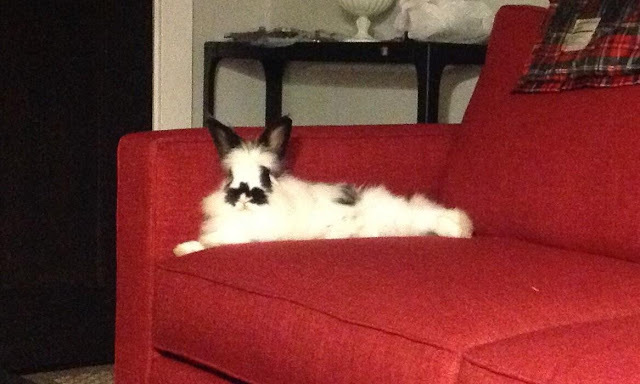 And a fine addition to that couch, is Harley. I had a couch kind of like that once. The cat took it. I am glad that these people and their couch are giving Harley the life he deserves.